Began in 1937; ceased in 1975. Began new numbering with DPS-1 (For release Jan. 24, P.M. 1955). Description based on: Apr. 1940; title from caption. Latest issue consulted: DPS-144 (May 1975). maintained at the 1958 level by a heavy volume of marketing. job opportunities for farm people continue to improve. abroad, larger financial reserves, and continued large U. S.
Seriod Year Mar. Dec. :a. Feb. .Mar. 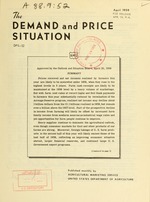 issue of The Demand and Price Situation. 1/ Federal Reserve Board. 2/ U. S. Department of Commerce. V/ Seasonally adjusted annual rates. monthly deliveries. 6/ Inventories, book value, end of month, divided by sales. V/ Bureau of the Census. 8/ U. S. Department of Agriculture, Agricultural Marketing Service. stocks of wheat and corn will be at new highs at the end of the current season. at the end of February compared with 7.3 billions a year earlier. year ago, is expected to show a small increase for the year. of 1959, it was about 4 percent larger than in the same period a year earlier. farmer and the consumer has apparently widened. running substantially higher this year. plans conducted by the Securities and Exchange Commission and the U. S.
should generate additional increases in consumer expenditures. as increased availability of U. S. cotton at competitive prices abroad. wheat, the 1959 crop support is essentially the same as for the 1958 crop. the same as those in effect the past year. charges and taxes per acre show increases of 8 and 6 percent respectively. a year ago, while feed purchased by farmers was slightly higher. quarter of 1958, though somewhat lower than the average for the year. but receipts from cattle and from dairy products will likely increase some. chased by farmers are rising as a result of expanding livestock operations. taxes and depreciation charges, are larger this year than last. spring, and prices will continue strong. with cash receipts approximating the 1957 record level of 4.6 billion dollars. 3 percent above a year earlier, despite sharply lower egg prices. than potential domestic and export market outlets. bushels, 18 percent below the 1,180 million bushels crop of last year. over of a-year ago and the 34.6 million cwt. held on August 1, 1956.
higher than those of the several preceding years. low price received by growers this season. by 14 billion dollars between the first quarter of 1958 and 1959. I/ Preliminary estimatesby Council of Economic Advisers. professional income each were up about 1.8 billion dollars. about 1 percent below the pre-recession high. until late in 1958 after the introduction of the new 1959 model automobiles. :dol. dol. dol. dol. dol. dol. dol. dol. uary-March they were 3 percent above a year ago. first quarter of 1959 were about 9 percent above a year earlier. credit was increasing, while a year earlier it was declining sharply. last half of 1958 and early 1959 more than offset increases in other groups. clothing were higher while household furnishings were unchanged. of Commerce and Securities and Exchange Commission. inventories at an annual rate of 4.0 billion dollars. dollars above the end of December 1958.
the same as a year earlier. sales ratios have declined sharply from the highs in the first quarter of 1958. Those in manufacturing in early 1959 were back to the levels of 1955-57.
investment in inventories is likely during the remainder of 1959.
above the final quarter of 1958.
the final quarter, but increased during the first quarter of 1959.
about a billion from the previous high in 1955 and 2- billion above last year. new funds should not be much greater than in 1958.
public highways, and smaller gains for other types of facilities. from the 1958 recession low, but 1,300,000 below the peak in August 195.
mid-May. The increase in durable goods industries may be more than seasonal. percent of the civilian labor force. reflecting higher wage rates and increased hours. in January-February at 148 was 18 percent above a year ago. United States Department of Labor, quarterly indexes computed by AMS. prices for feed grains, cotton, cattle and fruit were partially offsetting. Source: U. S. Department of Agriculture, AMS. the increase was among the production items, particularly feeder livestock. The support level announced for wheat is about the same as in 1958.
support level for tung nuts will not be announced until next fall. was 35.4 billion dollars, 4.2 billion dollars above a year earlier (table 7). slightly above the level of a year ago. 2/ Excludes gold holdings of French Exchange Stabilization Fund. 3/ Includes latest report figure (Oct. 31, 1958) for gold reserves. 5/ Not separately mentioned or included in regional totals. /5 Excludes gold reserves of the USSR and Eastern Europe. Federal Reserve Bulletin March 1959, P.331. lars to foreigners in 1958 in economic grants and loans, the same as in 1957. Federal Reserve Bulletin, March 1959, p. 246.
dustrial activity abroad, and the poor European wheat crop. of U. S. agricultural exports in both 1957 and 1958.
cent greater than a year earlier. than the increase in value. previous years was 175 million dollars. 450 million bushels compared with 402 million bushels in the previous year. smaller crops abroad and increases in foreign livestock and poultry numbers. sumption abroad are maintaining the level of exports. almost 50 percent below the 5.7 million bales shipped in the preceding year. ton will be kept competitively priced on the world market after August 1, 1959.
short domestic supply and fewer exports under the Mutual Security Program. tinue well below a year earlier. $2 and calf prices $3 to $4 per 100 pounds. year has been up about in line with the 17 percent larger 1958 fall pig crop. somewhat in April and May of 1958.
milk products will be large enough to hold prices at support most of the time. items other than feed are likely to be higher than in 1958.
hand, will be rising costs for most items other than feed. to 3.4 billion pounds of whole milk, compared with 6.8 billion in 1957-58.
year and reached a record of 941 million pounds in 1958-59.
the month before, and 7.0 cents below the year before. ago, and of generally younger age. 17.3 cents per pound, compared with 21.5 cents in March 1958.
turkey prices at that season might remain little changed from 1958.
able market outlets, and a sharp increase in carryover on October 1 is likely. lard during May-September 1959 will continue below the same months of 1958.
fourths of this year's total edible oil exports is expected to be soybean oil. program oil that is shipped before October 1, 1959.
of the 1958 crop. It would represent about two months crush at current levels. Virtually all of the carryover of old crop beans will be in the hands of CCC. date for loans and purchase agreements. its flaxseed by July 1, the beginning of the 1959-60 marketing year. 1959 by about 6 million acres, if they carry out their March 1 intentions. 150-155 million tons would be expected in 1959, with a normal growing season. mid-April this year than a year ago. record quantity for the 1958-59 season. 1948-57 average of 1,075 million. with 290 million in the same period a year earlier. would result in a further decrease in the carryover on August 1, 1960.
consumer income, is expected to continue at a high level this spring and summer. California also are underway. These strawberries go mainly to fresh markets. 3 percent smaller than a year earlier. somewhat below the relatively high prices of the spring and summer of 1958.
season totaled about 42 million gallons, slightly larger than a year earlier. 1958-59 season was 5 percent under corresponding disappearance in 1957-58. Packers' stocks on April 4, 1959 were about 17 percent below a year earlier. retarded crop development in that area. to aver-ige below the high levels of a year earlier. acreage of onions will be up about 12 percent. kraut would be substantially smaller, and lima beans slightly smaller. materially above those of a year earlier, and prices substantially lower. $6.22 per hundredweight compared with a little less than $3.00 a year ago. would average substantially below those of the current season. substantially from the 8.7 million bales carried over a year earlier. pounds were the lowest in 20 years. below the record 14.2 million reached January 20, 1956.
narrower than a year ago. cluded in the Conservation Reserve of the Soil Bank. last August and recently has been about one-half again as large as a year ago. use indicates larger imports this year than last. to raise the national average return up to 62 cents. hold about even with 1958.
of tobacco will not exceed the 1958 support levels. in 1957. Tobacco exports in 1959 may be fairly close to the 1958 level. o .. .H. ...H 1~ '0 *. is scheduled for release May 26, A. M.